Agricole is an independent Grain Marketing and Brokerage service based in Cambridge - working for progressive farmers since 1993. Agricole acts as the farmer's own private grain trader, working on his behalf to secure the best prices for combinable crops. Farmers tell us they are finding it harder to keep track of grain markets. Increasing workloads, volatile markets and lower grain prices make it harder to reach the right deal. The lack of good information forces them to react rather than anticipate market movements. Agricole provides a dedicated service based on specialist knowledge and tailored to your specific needs. 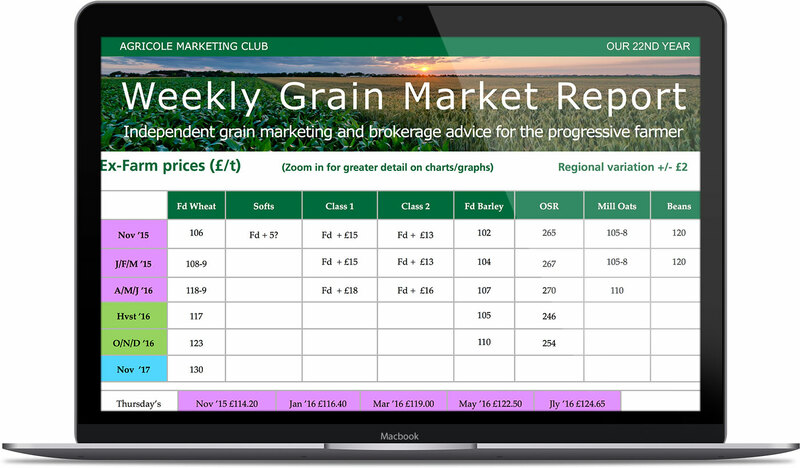 We provide timely information, a weekly grain market report with recommendations, hassle-free brokerage and marketing services using hedging via minimum priced contracts - a combination guaranteed to get you the best results. One call is all it takes to obtain accurate market information and a no obligation quote for services - find out more by calling us on 01954 719452 or emailing jeremy@agricole.co.uk. This is the original Agricole service. A 'beat my price' service, Agricole achieves a higher price or better total contract on approx 95% of the time. Over £1m has been saved for its clients since 1993. This service is, 50p/t. Now the largest sector of Agricole's service and the most important service to its clients. This is how clients make, and limit losing, revenue/margin from trading in the very volatile combinable crops market. Written on a Thursday evening, it contains impartial market information on combinable crops, ex farm prices, LIFFE futures close & currency. It is used to compare and contrast with other market information clients obtain. “Thank you for sending the article Stop Trading Backwards I have just read it with great interest. You have hit the nail on the head and I can relate to the scenario that you describe. “Thanks for latest bad news ! At least it is what I have been expecting. I cannot see any improvement in prices till this time next year, hence I completed selling 2011 crop two weeks ago which means it will rise now!